This week my son and I are visiting Meme and Gramps in Wakpala, South Dakota on the Hunkpapa Lakota Standing Rock reservation. It is September and the harmonic balance of sunny sweet heat and cool dry breeze that you watch come up on you as it washes through the grass like the tide leaves me in awe of my place in this world. When my son was born, he was placed on my chest and heard my heart, picking up the scent of the only world he'd known up to that moment. He raised up his head and looked at me and his father. 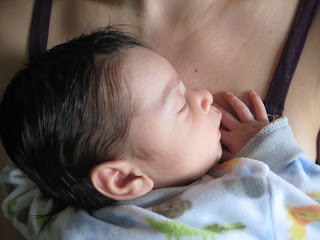 He stayed there with me for a long time and nursed within an hour of coming into this world. When morning came, he latched, but not as deeply as he needed to. In the half hour it took my lactation consultant to show me how to get my son where he needed to be, I realised that the world needs classes, books and midwives like mine because most of us don't live in little tiospes ("tee-osh-pi-e": Lakota for a sort of small tribe or extended family - a small group of a few families who live near one another- knit as a community.) These tiospes relied on one another for safety, food, community, company; they shared hot days and cold nights, feast and famine, danger and celebration. Reliant on one another, families were more than units, people more than individuals because they shared this life together. In my tiospe would be many other women - whether they were my mother and grandmother, aunties, or just other mothers with small children - to show me how to nurse my son. The bond that grows when we nurse our children is so powerful it's almost incomprehensible to me. Skin on skin, both scent and touch relax mother and child. In this silent touch something is said. Something is known and heard. Like the heart beating, like breath slowly rising and falling, mother and child hear one another's voices. Voices that seem to rise in a song that can only be sung when both voices rise. In this moment we hear the sounds of creation. This moment is a beat in the rhythm that comes not from humanity's pulse, but from the pulse of this earth - the tides coming in and going out, the seasons as they move from deep cold to heat we can smell, and back into snow and darkness. The breaking from its shell of a tree shoot, and the settling into the soil of a rotted out oak. The heartbeat your child hears doesn't come from your chest, it emanates from the center of this earth out into every heart. The bond that grows is that of knowing we are essential members of the tiospe. In this moment when the mother gives all that she has night and day month after month to her child, who is completely dependent on her for everything that he is and can be, we know that we are all that child - dependent on this world for everything that we are. And we are all that mother - responsible to care for the creation we come from. This relationship of dependence and sacrifice is tenuous for Americans. Taught to be independent, self-sufficient and ask nothing of anyone, we don't want to be dependent and we've been taught that sacrifice makes us weak and vulnerable. The kicker is this: it's not our choice. We are dependent, and we have to sacrifice. Or what we lose is the tiospe. Without the tiospe nothing we do has meaning, because it is meaningful to no one but ourselves. When the seasons, terrain and living things move in harmony, the balance that supports life is maintained. Harmony is found in both dependence and sacrifice. P.S. Don't worry, Papas, I'm gettin' to you next week. P.P.S. This blog is one big soap box, but before I hat the guts for it, the one issue I shouted long and loud about was the American bison. Here's why: bison hooves are cloven. When they walk the earth, their hooves break it up allowing the rain that falls to be absorbed by that earth. As bison have been replaced by cows (flat hooves) in the Midwest and West, the earth has been packed flat. Rain runs off, taking topsoil with it. As the earth gets drier, it turnes to dust, and more topsoil blows off. This degrades soil quality and makes the earth hotter and drier. The desertization of the American midwest and west (which is spreading in both directions) causes increased drought and hotter temperatures in our country, increasing climate change. Eat bison - it's delicious, has more better fats, fewer bad fats, fewer calories per ounce than even ostrich, and contributes to a market we need to grow in order to bring back the bison. 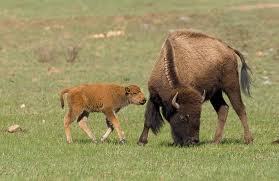 Fun fact: Bison don't get cancer. That's an animal I'm honored to depend on and sustain.